The Horse Forum > Keeping and Caring for Horses > Horse Health > Horse's shod now uncomfortable on feet. Horse's shod now uncomfortable on feet. My horse's got shod all 4 yesterday morning. Neither behaved real good. My boy tried kicking farrier quite a few times. Other gelding leaned and was just a jerk. They both spent most of day laying down. Are up this morning but still short of stride, not limping but not striding out like normal. Both were fine before being shod. Had to get after my boy a lot ,he was in one of his moods. He doesn't want to do anything asked wasn't liking having feet done. Is this normal after being shod? ?...after being barefoot since last fall. Last spring they were fine after being shod. We spent a few months with a bad farrier once and he did not trim my mare correctly. After getting her trimmed correctly she was very sore, to the point of me being unable to work her. Called the new farrier and he said it was totally normal for her to be sore because he did a lot of work. It may be possible that they are sore from the trimming instead of the shoeing. No, not to me it isn't. My paint horse, well all my horses are barefoot, trimmed every 5 weeks cause they grow so much hoof. When my horse was going to be in a competition where footing was questionable, he got front shoes. Farrier shod, trimmed and we went for a ride 20 minutes after farrier left. To me, there should not be any detrimental change to their gait. I've been told no horse should be "off" after a farrier works on them or something is up...call your farrier. A ouchy horse after work done is a horse who you need to have re-looked at...a nail reset. To close or a hot nail is cause and reason for a abscess to occur...make a phone call. They could be reacting to the thump of the nails being placed in the shoe...but today that all should be gone. A horse having shoes put on and then limping...make me worry he got a hot nail or a real close one if he isn't limping but "off" to your accustomed seeing him move. I don't tolerate that, period. My horses know to lift a foot, not "sit" on my farrier and to behave. I have "0" problem correcting their poor manners as it is happening with a word of warning to my farrier it is coming..
RegalCharm, Whinnie and AtokaGhosthorse like this. They should feel better after being shod/trimmed...not worse IMO. For them to both acting the same, it sounds like the farrier may have not done such a good job. loosie, RegalCharm, JCnGrace and 2 others like this. No Rambo, that is not right, especially if they're sore enough to want to lay down! Sounds like the farrier trimmed them too short or such(did he rasp/pare into sole? was it hot shod or cold?). Do NOT force them to work on sore feet. I'd actually request the farrier come back and remove the shoes, then give them a couple of weeks off & then see how they are. After getting her trimmed correctly she was very sore, to the point of me being unable to work her. Called the new farrier and he said it was totally normal for her to be sore because he did a lot of work. Heather, this is evidence that the farrier did NOT trim correctly!!! While she may have needed big changes in her feet, it is NOT appropriate to do too much/too fast and it is NOT appropriate, should not have been accepted that he made her sore! RegalCharm, greentree, Acadianartist and 4 others like this. They were cold shod don't think either was trimmed to short. He didn't pare or rasp into soles. Took off extra hoof wall with nippers. Horse's weren't real well behaved my boy is weird about having hinds messed with. He was very leery of farrier this time. They are used to me trimming their feet and I don't jack feet up like Farrier did, could of been part of issues with behavior. I do make them mind there manners both pickup feet no issues. No ice in corral where horse's like to stand some ice where there is wasted hay build up. Should of put more info in first post..
Not forcing them to move or exercise wouldn't do that. Called farrier told him both horse's are sore from being shod. He will be out tomorrow to check them. Said possible he got some nails to close to sensitive part of hoof. I know he had to pull a few nails and re nail. My boy was a bit kicky not liking being shod. As you know he's a work in progress. This Farrier is extremely patient with horse other farriers in past haven't been. Losing tempers and getting rough with him. He's been hog tied in past to do feet...before I owned him. RegalCharm and Whinnie like this. 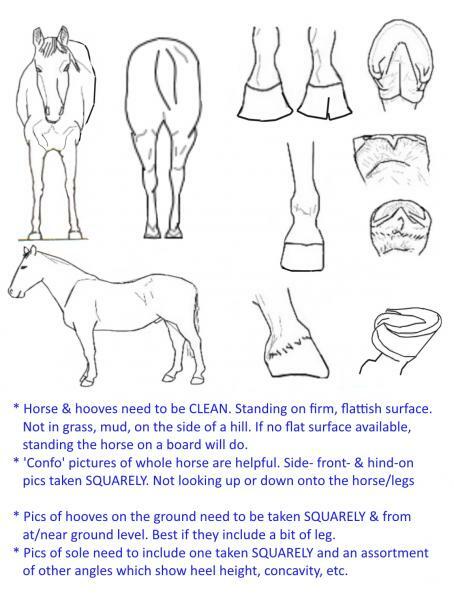 Only time I'd accept a horse being sore after shoeing was if you were experimenting with different wedges/frog support/ pads, ect. Then you'd pull the shoes and try something else. If they are being bratty for the farrier because he holds their legs different, I'd bet you they are sore back there all the time. Doesn't have to be obvious, but when they are held flexed and in difficult positions, joints start hurting. They're bad because it hurts, the farrier gets rougher/takes longer, so it hurts more, then you have a sore horse the next day. The being sore was same day they were shod. Farrier never got rough with them. Getting rough with my gelding gets you no where. Took farrier an hour an 10 mins to shoe both horse's. He holds feet up higher but keeps them pretty close to under horse as possible. So no weird angles going on. The black leaned he kinda does that anyway, he's a lazy pig about holding up feet. He coming back tomorrow so hopefully it some close nails, easy enough to fix that. Feet have a little heat in them so it's definitely in feet. They have been laying down more then normal today also. Off to check horse's then going to bed...Farrier will be here at 7am. If cold shod, at least no chance of being cooked - I've seen a horse have to be put down because a farrier held a hot shoe to his trimmed foot too long & literally cooked the circumflex artery!! As to their behaviour, yes, if he 'jacked up' their feet too much, that may have caused a prob, along with your boy already being edgy & defensive because of prior treatment. RegalCharm and Kalraii like this. Both horse's were fine this morning when farrier came, heat gone and soreness gone. RegalCharm and PoptartShop like this.